October marks the start of my favorite time of year: when we hop from one holiday to the next. It kicks off with Halloween and continues straight through New Year's Day. There's decorating. Shopping. Family time. And a crazy work schedule. Fall and the beginning of winter are probably my most hectic time of the year as a freelance writer-blogger-publisher, largely because I have so much else going on. It's also the time of year when I take a few weeks of vacation time, leaving me less time to focus on projects. So I have to make the most of what time I do have. Last fall was productive. I wrote the bulk of my first mystery novel during November for NaNoWriMo (which I'll participate in again this year). 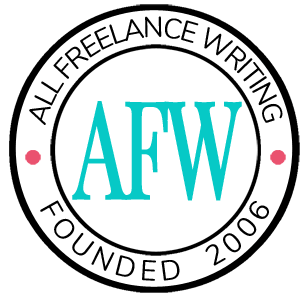 I merged three sites, including All Freelance Writing, to create the site you're visiting now. And I made some big changes to my freelance business in an effort to spend even more time on the Web publishing and indie publishing sides of my business. I can only hope these three months are as productive as last year. That said, things have not gone as well as I hoped over the last quarter. That's not to say I slacked off. But priorities changed, as they often do, as new projects came up. In my 2014 mid-year evaluation, I mentioned some writing goals and progress updates. Here is a summary of some of the things I still wanted or needed to do after my mid-year check-in, and where things currently stand. Cut back on my number of freelance clients by at least 50% by the end of 2014. Anything else previously planned for this year was already on my "probably-to-definitely being pushed to 2015" list. Like last fall, I did make some unintended progress on top of my planned work. Here are some of the other things I worked on. I took on a website development project for The Horror Writer's Association. We launched the site on October 1st for our new Horror Selfies campaign. And so far it's going very well. I was happy to be a part of the project. I redesigned All Freelance Writing. Wait. What? Yeah. You can't see it yet. The official design change will go live when the e-courses and podcast series launch (or shortly after). I still need to overhaul a few things content-wise to accommodate the changes. While the design will be different, it's built on the same theme with the same basic structure. So you won't have to go digging around for most things. It was designed to have a new look but a familiar interface for you. Quite a few things have been going on on the back-end of All Freelance Writing, from speed optimizations to the improvement of older content. There's still a lot to do, but I'm delighted with the progress so far. I landed several new clients that I enjoyed working with (always a nice addition). Make one more official adjustment to my client schedule, cutting freelance work down to two days -- I'll likely post the updates before my vacation time in December and they'll go into effect on January 1st. Write three blog posts for ProBusinessWriter.com. My goal is to write them all in October and schedule the later two in advance. Write six blog posts for my genealogy blog. Again, I hope to get through most, if not all, of them in October so I can pre-schedule them. Finish at least the first e-course for All Freelance Writing (editing and some supplementary material -- based on a free e-book I already have here). That course will be free. If I can squeeze it in, I might also release the first premium e-course, but I'm not counting on it. Continue working on the first mystery novel revisions. I don't know if I'll complete this draft by year's end. I just want to make some significant progress. If I do finish the next draft of the mystery novel, take care of the script for the first tie-in game. Continue with my picture book drafts (next year will be a heavy revision year for those, along with deciding on an illustration / final publishing plan). To make this easier, I'm tying picture books in with my flash fiction challenge in October. Work on revisions of The Query-Free Freelancer. I'd like to finish this draft by the end of December if at all possible. Publish three new e-books here at All Freelance Writing. Draft my first horror novel (rough draft) during NaNoWriMo this November. Draft up to my 13th horror short story for a collection -- I'm going to work through as many of these as I can, likely making December's challenge focus on short stories (though I will probably only work through the 18th, so that will be a shorter challenge than usual). I'm going to launch my All Freelance Writing podcast series. I'm going to implement a design change here at All Freelance Writing (when the first e-course and podcast are ready to go). I'm going to outline another novel I have planned, so that I'll be ready to move forward with the first draft early next year. What about you? Did you make good progress during the last quarter? Have you made any big adjustments to your writing goals for the year? As always, so in awe of your productivity 😀 Your transparency in your goals & progress is so helpful & inspiring to me. Really looking forward to seeing the All Indie Writers redesign!! Wow Jenn, you are very ambitious and very productive! I noticed you have many things that are only partially completed. Have you thought about putting even more projects on the back burner and then focusing on getting the most important projects fully completed? Or perhaps that’s what you’re doing now? I do that on a regular basis (it’s why, for example, I back-burnered the new marketing blog while I work on larger overhauls here at AIW). What I have listed here consists of mostly priority projects. There are quite a few more that didn’t even make it into this year’s goal list (and quite a few others that were purged in earlier check-ins / re-evaluations this year). The ones that are partially completed here are long-term projects. They’re intended to be spread out in various phases (especially publishing and Web dev projects), and others are simply things that need to be worked into my regular rotation (like monthly or bi-weekly posts on two of the blogs that need more attention). Not doing that consistently yet is solely a result of me failing to make them regular habits.